If you’re having trouble when you right-click a file, folder, or drive in Microsoft Windows, it may be because you have too many items listed in the -right-click context menu. 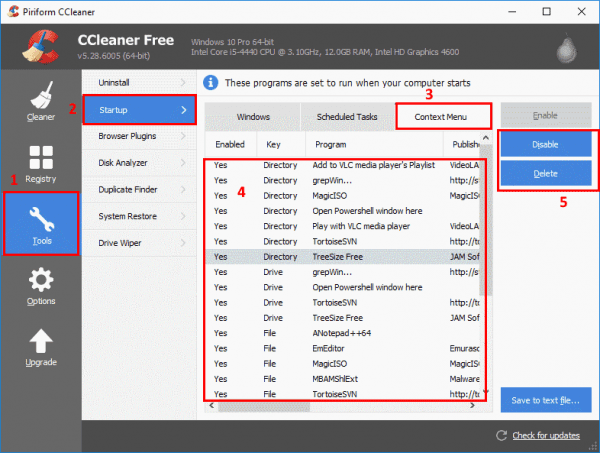 You can clean it up with the CCleaner utility using these steps. Download and install the free version of CCleaner. Select “Tools” in the left pane, then choose “Startup“. Select the “Context Menu” tab. A list of items appear that represent context menu options for right-clicking directories, drives, files, and folders. Disable or delete the ones you can do without. If you disable an item and decide you want it back later, you can return to this screen and “Enable” it again. Once you have removed as many items as you can, right-clicking files, folders, and drives should perform better.